If you want to ensure you travel in style during your time in Chesterfield, why not choose our 16 seater executive Mercedes vehicle? It looks good and has everything you need to ensure you are the rest of your party have an amazing trip. You can rest assured that your vehicle will be between 2-6 years old, depending on availability at the time of your booking. Our team here at Chesterfield Minibus Hire always work hard but if you choose this executive package, your experience will be made even more personable. These vehicles are perfect for a number of different occasions and remain popular with VIP tours. They have carpeted aisles, leather interiors, privacy screens/curtains, armrests, private lounges and a whole lot more that the standard type vehicles do not have. You can even watch a DVD on a plasma screen when riding in this vehicle! 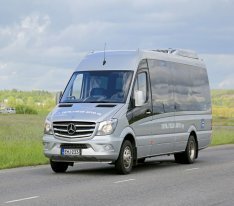 In addition to the Mercedes, you will be assigned a professional and friendly driver from Chesterfield Minibus Hire. The driver knows the area really well and will take you exactly where you need to go. You can get in touch with us right now for a quote and before you know it, you will be enjoying our services.